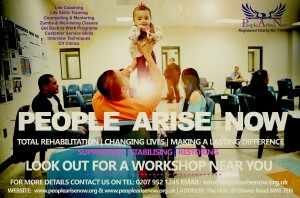 People Arise Now (PAN) is a charity which provides support to ex-offenders and give stabilising support for family members of prisoners and ex-offenders, through mentoring, well-being activities and various workshops. The charity also provides ex-offenders with rehabilitative support to aid community integration and cohesion. A key aid to total rehabilitation is by equipping our beneficiaries with employable and sustainable life skills. We aim to lower re-offending rates by providing ex-offenders the tools to successfully resettle back into the community. We utilise professionals such as psychologists, life coaches, educationalists, counsellors, mentors, drug experts, independent probation officers and independent social workers. We also partner with other organisations and companies, to provide quality all-round support and assistance. Do please get in touch to find out more about us.